Mini-Golfing is one of my favorite things to do in this area! There are tons of places to go mini-golfing in the area, and my husband and I have tried 4 of them so far! I have found them each to be very enjoyable in their own unique way! In addition to those 4, I will mention one more to make it an even 5 (they are listed in no particular order)! Firehouse Golf sits in the center of the Walden’s Landing shopping center in Pigeon Forge. Every time I pass by, I long to stop there and try it out! It just looks SO fun! They have two 18-hole courses with a total of 6 waterfalls and all kinds of firehouse and fireman themed decor! And of course, just a few steps away sits Firehouse Subs, one of my favorite places to eat! Hillbilly Golf is a mainstay of Gatlinburg! It has been around as long as I can remember! You get to ride the incline up the side of a steep hill into the woods, get out at the top, and work your way down one of two courses, both interspersed with old farming equipment! It was definitely challenging, and an enjoyable experience! I think this will have to be my favorite place so far! The Davy Crockett Mini-Golf sits at stop light #1 in Gatlinburg. It features two 18-hole courses, one of them a little more challenging than the other. While playing, enjoy extremely fun props, some of which move and make noise. Some of these are triggered when you make certain shots! Fun music plays all around! When you’re done, head across the street to Heifer’s Dairy Dip for some delicious hand-dipped ice cream! Then keeping walking across the next street and rent a cabin from ERA in the Smokies! This is probably the biggest mini-golfing place I’ve seen so far, and is also tons of fun! It sits in front of the Tanger outlet mall, so you can drop off the avid shoppers in your family, and those of you who would rather play mini-golf or enjoy the arcade can do so! This one has three 18-hole courses, again, with extremely fun props, music, and sounds to enjoy along the way! Going to the Track Mini-Golf was my husband’s pick, and I have to say, it was a good choice! It also offers two 18-hole courses, and the one we did was challenging and enjoyable, winding around interesting props of bright colors, up a hill, and back down, etc. I would definitely recommend this one as a one-stop-shop for those who might also be interested in go-carts, bumper-boats, an arcade, and much more! It’s time again for the ERA for MDA Golf Benefit. We had tons of fun last year, and we can’t wait for this year’s event, less than 2 weeks away! This golf event falls around Labor Day…I think it is a great idea for a great cause. On Wednesday, September 8, 2010, ERA In The Smokies Realty & Rentals will be sponsoring the 12th Annual ERA for MDA Golf Classic for Jerry’s Kids. 11. a.m. We’ll have a great lunch sponsored by the fine folks at No Way Jose’s. There is still snow on the ground, but Spring Break will be here before you know it. I know that many of you think of the beach for Spring Break, but I want to challenge you to consider a mountain trip this year. 1. The Strip. We know that wandering “the Strip,” wherever it may be, is one of the biggest attraction to heading to the beach during Spring Break. 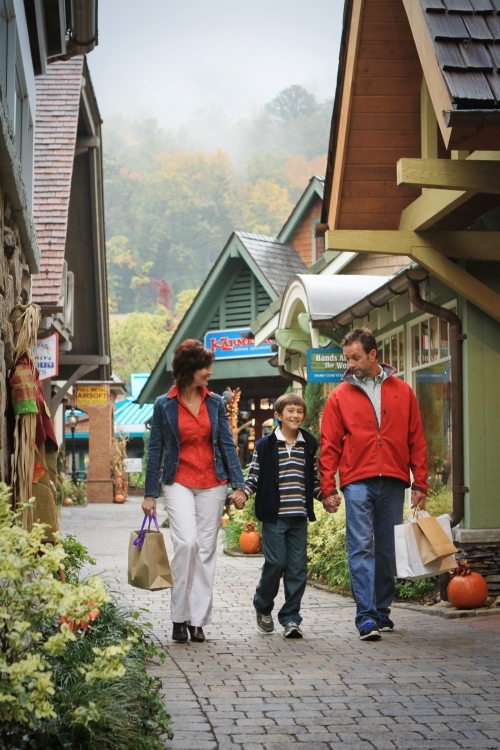 The Gatlinburg area offers “The Strip” in more than one location! 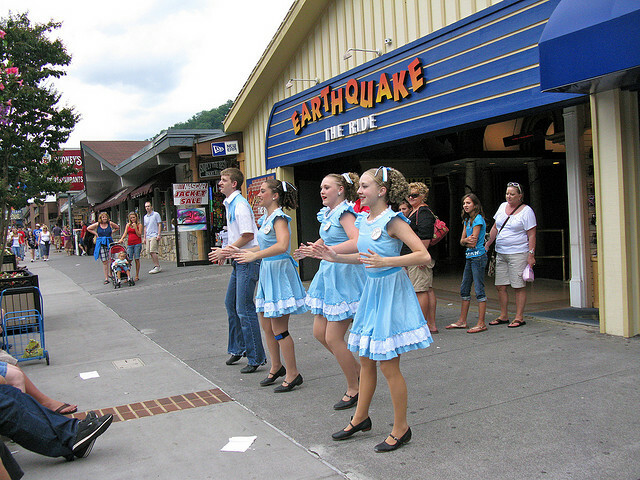 You can wander the Strip in Downtown Gatlinburg to take in cool attractions like the Ripley’s Believe It or Not Museum or stop for a corn dog at Fanny Farkles Arcade. Or, you can head to Pigeon Forge and find the perfect Smoky Mountain T-shirt, stuffed bear or souvenir for the friend or family member that couldn’t make the trip. If neither of those options suit you, give the Smoky Mountain Arts & Crafts District a try. While you are at The Track enjoying a ride on the Wild Woody go kart track, make sure you put on your brave face and take the 65-foot bungee jump plunge at The Track! 4. Lazer Tag. Here’s a fun idea for the whole family. At Lazerport Fun Center, they offer the largest laser tag arena in the Great Smoky Mountains area. There are two arenas at over 7,000 square feet that offer the best most exhilarating and heart pounding fun and excitement that Pigeon Forge has to offer! Each game lasts for a period of 15 minutes each, and they run back to back games starting every 20 minutes! Whether you choose to play one, two, three or unlimited games, take the challenge today – test your skills against your friends and family alike! 5. Flyaway Indoor Skydiving. This vertical wind tunnel that allows you to experience the freedom of human flight and is located at traffic light #5 in Pigeon Forge. As a flyer, participants attend a 20-minute training class, receive a suit, helmet & other safety equipment. Following a short review of the basics, a group of 5 flyers enters the wind tunnel with their instructor. Almost anyone can fly as long as you weigh at least 40 lbs. Watch this video for a preview of kids in flight. Link to pricing & coupons. 6. Roller Skating. When is the last time you went roller skating? If the idea conjures awkward images of retro fashions and braces, maybe it is time to try again. Spin City USA, the newest indoor Pigeon Forge attraction for family fun, is a state-of-the-art roller skating rink located in downtown Pigeon Forge. Spin City USA offers theme nights including retro skate and live entertainment by their own DJ for affordable fun, with holiday special events held throughout the year. When looking for fun things to do in on a rainy day, try Spin City Roller Rink. Due to the great response I received to the Smoky Mountain Golf post, I thought I would take the time to tell you about another golf event that falls around Labor Day…I think it is a great idea for a great cause. On Wednesday, September 9, 2009, ERA In The Smokies Realty & Rentals will be sponsoring the 11th Annual ERA for MDA Golf Classic for Jerry’s Kids. 11. a.m. We’ll have a great lunch sponsored by the fine folks at Lineberger’s Seafood.